Since I didn’t post a hot Product last week, I decided to talk about two that I have been loving this week AND they are extremely inexpensive! 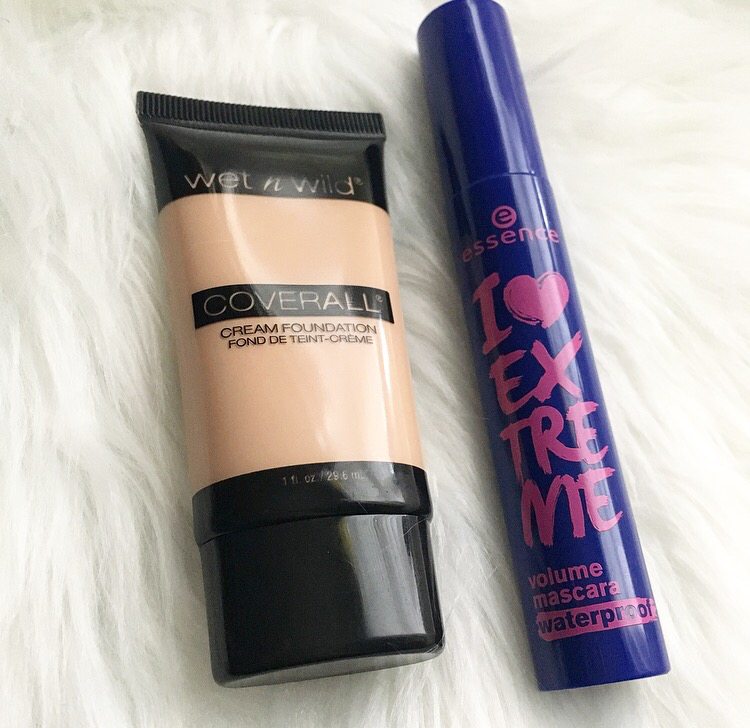 The first product I have been loving is the Coverall Cream Foundation from Wet N Wild. I got this for $4 from my local drugstore and because of the low price, I was kind of afraid to try this foundation because I was worried that it would make me break out or just look unflattering on the skin. But, I was pleasantly surprised by how beautiful this foundation looks and that it didn’t bother my skin at all! It has a natural matte finish and gives a good medium coverage, but it is buildable. The consistency is pretty thick, (if you tilt your hand it won’t run down), so I was expecting this to be really heavy and cakey, but it actually blends out really nicely. If you don’t want to spend a lot of money on a high end foundation, or even a L’Oreal foundation, this one is less than $5 and is a fanatastic product. The next product I have been loving this week is the Essence I Love Extreme Volume mascara (waterproof). This mascara is really great if you want to add natural-looking volume to your lashes and it can also work as a lengething mascara as well. It does not make your lashes look clumpy, doesn’t flake, and holds the curl really well. Even though it is a waterproof formula, it comes off pretty easily with a makeup removing oil. This mascara is great and the fact that it’s less than $5 makes it even better!